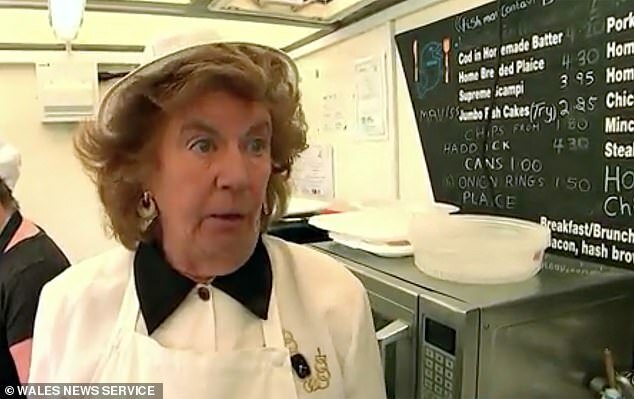 A chip shop owner died and her husband was arrested after she grabbed a deep fat fryer to stop herself falling over and more than a gallon of boiling oil fell on her, it was claimed today. 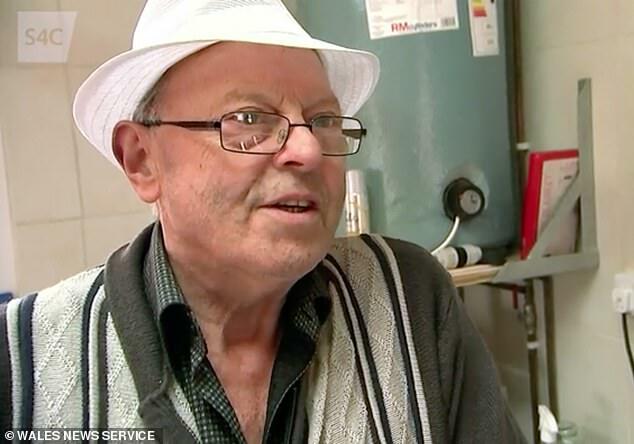 Grandmother Mavis Bran, 69, died of severe burns after the 320F (160C) liquid fell on her at the chip shop she owned with her husband Geoff, 70, in Hermon, near Carmarthen, West Wales. The former pub landlady was rushed to a specialist burns unit, but died at Morriston Hospital in Swansea six days later. Mr Bran has been arrested on suspicion of assault, while neighbours claim his wife sustained her horrific injuries trying to steady herself in the kitchen on October 23. Shocked next-door neighbour Vee Gower, 78, who was with Mrs Bran just 45 minutes before the incident, said: ‘We had just got back from Spain and because she’s so lovely and neighbourly we bought her a bottle of brandy. ‘She was her usual bouncy self, full of life and asking us about our holiday. Mrs Gower and her husband Bill, 78, who bought land from the Brans to build their retirement bungalow in the village, returned from a shopping trip three hours later to be told Mrs Bran had been flown to hospital after a tragic accident. Mrs Gower said: ‘We heard she slipped and went to grab not something. ‘She grabbed the deep fat fryer to save herself and tipped boiling fat all over her. 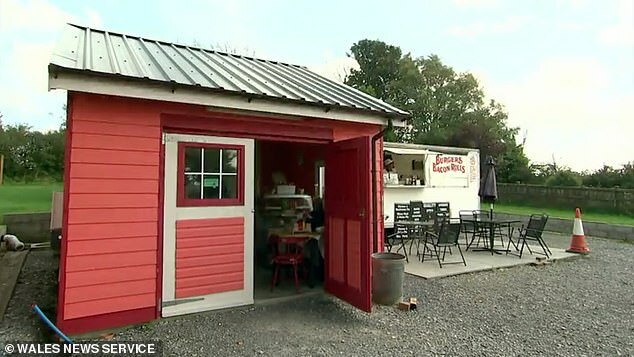 The couple came out of retirement after moving to their £550,000 home in the Welsh countryside and getting ‘bored’ in January to open their popular Chipoteria takeaway. Mrs Bran was known for cheering up elderly and needy people with hearty meals – and not charging a penny. She and her husband had owned several pubs and restaurants where she was the chef and he looked after the bar. Mr Bran, 70, and other family members worked hard to build her a fish and chip shop from a cabin in a roadside yard next to their luxury home. Just a month ago Welsh language TV channel S4C filmed a feature on the quirky wooden shack next to the couple’s eight-bedroomed home. Ever-smiling Mrs Bran boasted she was cooking 122 portions of cod every week. Customers Ken and Cerys Davies told the TV cameras: ‘We come here once or twice in the week and then for dinner on Sunday. She was behind the counter on October 23 when the deep fat fryer fell onto her. Villagers said she was heard screaming in agony before passing out on the floor A sign outside today said the business was ‘closed due to illness’. A bunch of red and white carnations were left outside as well. Neighbour Mrs Gower added: ‘We can’t believe it, Mavis was always so full of fun and lovely to everyone. ‘She was an amazing cook and fed some of the elderly folk here in the village. ‘At Christmas she would have 15 family members around but she would cook enough for 50 people. ‘Last Christmas she rang us and said to take the car around to pick up some food she’s cooked. Pensioner Bronwen Evans, 83, who lives in the village paid tribute to Mavis’s kindness while she was receiving from a knee operation. Mrs Evans said: ‘She was a fantastic cook and so kind to everyone. Neighbours today claimed the couple, originally from Reading, were devoted to each other and there had been ‘no problems’ in the past. They had both been married before – Mr Bran had a daughter and his wife had a son, but they had no children together. A spokesman for Dyfed Powys Police said: ‘A 69-year-old woman has sadly died at Morriston Hospital on Monday, October 29. ‘A 70-year-old man has been arrested in connection with the incident and released on police bail whilst the investigation is ongoing. HM Coroner has been informed.